As a society, we are constantly looking for something like the “fountain of youth” to turn back time and fix things like wrinkles, dry skin, acne, and every other skin problem we have decided is a sign of aging. To put it simply, we want to look and feel young again, forever. While we may not ever find a true “fountain of youth,” there are certainly some natural substances like oils that could do the trick instead. In fact, there’s a specific oil that comes from what the people of the Amazon like to call the “tree of life,” and it may very well be the answer to some of your anti-aging prayers. I am talking about buriti oil, an oil with a wide range of benefits to your skin and hair. Buriti oil comes from the Buriti palm tree, which can be found in the swampy and tropical areas of South America, although the tree tends to be concentrated in Central Brazil and the southern Amazon basin. This tree is also known as the moriche palm or ité palm, and its scientific name is Mauritia flexuosa. The palm tree looks very similar to that of a normal palm tree you which might expect to see elsewhere, with large leaves coming out of a rounded center that typically reaches about 115 feet or 35 meters high. The tree grows pale yellow flowers that bloom between December and April each year. The fruit of the buriti palm tree, which is where buriti oil comes from, is shiny and round, with bumps covering the outside of it. The exterior is chestnut-colored, and it opens up to expose a yellow, fleshy pulp surrounding a hard nut seed, which is edible. Before it was used for the extraction of oil, the buriti palm tree fruit was actually used as a source of food, and it can still be seen today being used in things like drinks, ice cream, and preserves or jams. Even further, the name of the capitol building is Palácio do Buriti, which can be translated to mean the Buriti Palace. While the fruit of the buriti palm tree can be used for many different purposes, the primary purpose of the fruit is for the extraction of a potent oil, buriti oil, that can be used for its many benefits, including the healing of chronic skin conditions like eczema and psoriasis, and even perhaps combating cancer. Other than beta-carotene, buriti oil is full of several other powerful nutrients as well. It is a great source of essential fatty acids, which help to make the skin feel and look soft and moisturized. The oil is also a great source of vitamin E and vitamin C, which are both powerful antioxidants that work together to protect the skin from things like signs of aging and environmental stressors. Buriti oil can be used for many beneficial purposes, thanks to the many powerful nutrients of which it consists. Experts have found that buriti oil can be used to nourish both your skin and hair, which makes it a great, versatile option for any skincare or hair care routine. In fact, the benefits of using buriti oil are also beneficial to your overall health as well. The very high antioxidant levels found in buriti oil is the main reason it is used so widely on the skin. Antioxidants like the ones found in buriti oil can combat the damage done by free radicals and help prevent or even revers early signs of aging. When it comes to your skin, buriti oil is great for cooling, soothing, and refreshing skin that has seen better days. Other than making your skin feel better, buriti oil can also improve the overall health of your skin due to the many healing nutrients and minerals that it provides. Every nutrient found in buriti oil works together to combine into a powerful, anti-aging treatment, but it helps keep your skin young on the inside just as much as it makes it look young on the outside. The vitamins found in buriti oil help protect your skin from the stressors you experience in everyday life, locking in your skin’s moisture and keeping it fresh and healthy. Generally speaking, buriti oil can help with many specific things, such as reducing wrinkles or fine lines, lightening dark spots on the skin, protecting the skin against ultraviolet rays, moisturizing and rebuilding skin cells, protecting the membranes of skin cells, and restoring the elasticity of the skin. 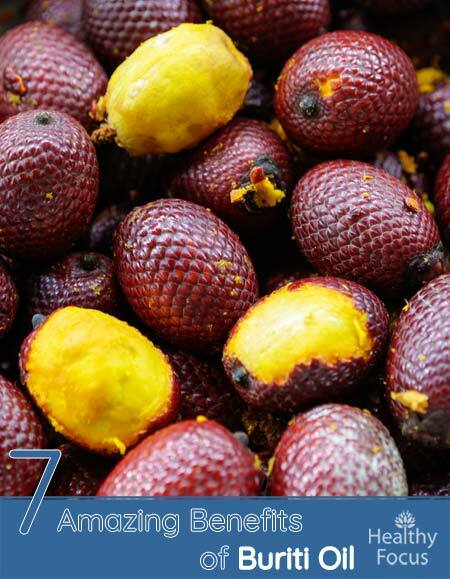 Buriti oil may also help reduce irritation, redness, or rashes found on the skin. The anti-inflammatory properties of the oil make it suitable for even those with sensitive skin, although those with sensitive skin might want to avoid using the oil directly on the skin and instead mix it in with a moisturizer or other type of daily lotion or skin cream. Buriti oil is also very commonly used in hair care routines for many of the same benefits that the oil provides to the skin. The hydrating power of buriti oil can be used to ease frizziness and help detangle hair, especially when applied to hair that is wet. If applied to dry hair, it can help bring moisture back to dry and brittle hair, and it can even be dabbed onto the ends of your hair to help heal split ends. Buriti oil can be used to moisturize, strengthen and smooth your hair. It makes a great addition to a hot oil treatment. Alternatively, add a few drops of the oil to your comb or brush and and use it in the same way as you might use a hair gel to control frizzing. Unlike commercial styling products, buriti oil does not contain alcohol and does not cause the same drying effect. It can also help protect your hair against damage caused by pollution or the sun. So, we know that buriti oil is good for the skin’s health in general. Its fatty acid content, antioxidant and anti-inflammatory actions make it a great choice for moisturizing the skin, helping you look young and treating various skin conditions. Researchers have also found that it can protect your skin against damage caused by harmful UV rays. If you are prone to dry, chapped or cracked lips, then try applying a little buriti oil to your lips. Not only does the stuff keep your skin healthy and moist, it can have the same effect on your lips. Buriti oil can moisturize your lips, protect against extreme weather conditions and help prevent your lips from becoming cracked and dry. Not only is buriti oil full of nutrients and various antioxidants, it also contains excellent anti-inflammatory effects. These anti-inflammatory activities are another reason why buriti oil makes for an excellent skin remedy. It may help treat a range of inflammatory skin conditions like psoriaiasis and eczema. According to research published in 2017, the anti-inflammatory benefits of buriti oil may extend beyond skin care. It is possible that applying buriti oil topically could help reduce inflammation in the joints and muscles and may help ease swelling in people with arthritis. Animal studies suggest that buriti oil may help improve metabolism and could help reduce cholesterol levels. A study published in 2015 investigated the effects on rats fed a diet of buriti oil for 28 days. As of the time of writing, there have been no studies into the effects of buriti oil on cholesterol levels in humans. A comedogenic rating refers to how likely a certain substance or material is to irritate or clog your pores. If a substance or material is likely to irritate or clog your pores, it might cause acne or make any existing breakouts worse. Substances are rated on a scale of zero to five, with lower numbers representing a lower chance that the substance will clog your pores. Once a comedogenic rating reaches a three on the scale, it is likely that you will break out due to using the substance in question. With that said, higher ratings may not always make you break out, as it depends solely on your skin type and the types of substances that you specifically can tolerate. Buriti oil contains 8% to 15% palmitic acid, 1% to 5% stearic acid, 45% to 65% oleic acid, and 10% to 25% linoleic acid. These percentages have led experts and scientists to give buriti oil a comedogenic rating of 2, which means that most people won’t experience any clogged pores when using it. With that said, there are some people who might, so you should still be careful when testing the oil on your skin. If you are prone to having sensitive skin, you might want to mix the oil with a moisturizer to ease its application onto your skin while still reaping the benefits. If you want to experience the many benefits of buriti oil, you could simply rub a few drops directly onto a clean area of your skin. You might also choose to mix in a few drops of the oil into your typical daily moisturizer so that you get the added benefits of both in one; the moisturizer might also make the oil easier to work with while rubbing it into your skin. To use buriti oil in your hair, you could rub it directly in or you could mix it into your shampoo or conditioner during your shower routine. In the end, it is hard to deny the power and overall benefits of something that is so highly praised by so many people. If the people of Brazil and the Amazon have given so much attention to this tree, its fruit, and the oil that can be extracted from it, that there must be a good reason to use it. 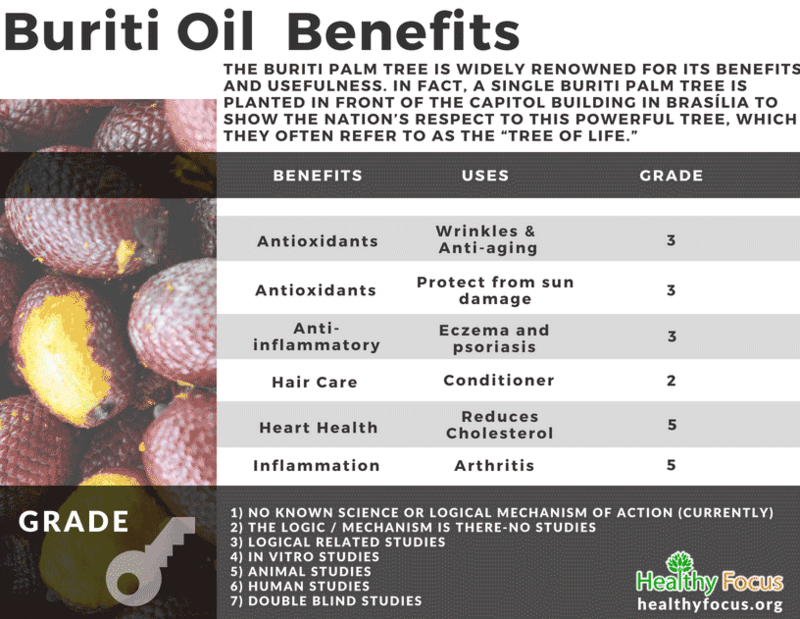 Of course, the many benefits of using buriti oil tend to speak for themselves, as it’s hard to ignore how absolutely powerful it can be. While buriti oil is typically great for people with sensitive skin, you should still be careful using new substances if you know that you are prone to rashes and irritations, or you have sensitive skin in general. If you visit a dermatologist frequently, you might want to speak with them before adding buriti oil to your daily skincare routine. If not, try using the oil on a small patch of skin to start, and see if you have any kind of reaction to it there. If you do have a bad reaction, there are plenty of other beneficial oils that you can use instead, so you shouldn’t feel too bad about it. Have you ever used buriti oil? If so, let us know what you thought of its effects. We would be delighted to hear from you.